Cedar Nut Oil Second Pressed, 100 ml. Composition of the first and the second cold pressed oils. The first cold pressed oil is produced by hand on the wooden presses, then all the remaining cake is dried, crushed, put in bags, and pressed again on the metal presses. So that the second cold pressed oil is obtained and bottled. Pure Cedar Nut Oil is a valuable beauty product recognized around the world as one of the best for skin care solutions and cosmetic problems. 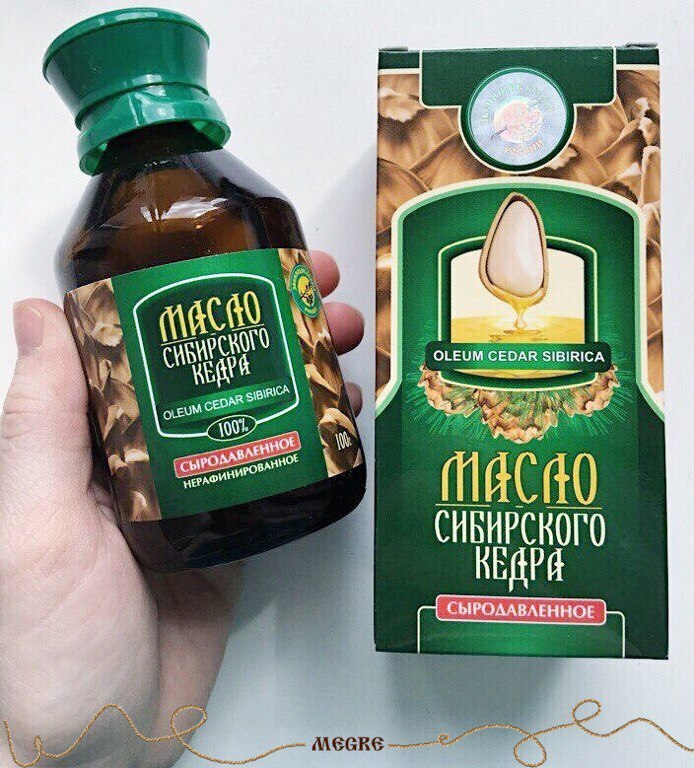 Due to the concentration of mineral substances, unsaturated fatty acids and vitamin E, which is a strong natural antioxidant the oil has high biological value. It is used as a care product for the face and body, which moisturizes and softens the skin, makes it more supple and elastic, it is also a natural filter of ultraviolet radiation, and can be used when you tan or just going out. 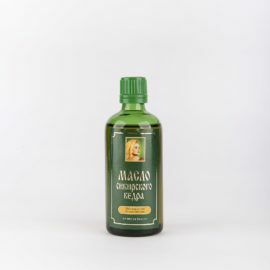 The Oil promotes healing of the skin from inflammations, rashes and sores; it is a hypoallergenic mild cleanser to remove makeup, including around the eyes. You can add it to enrich any cosmetics, to prepare a nourishing mask for the hair, which restores its structure. It is also used in cooking as a valuable nutritional supplement to any dishes from desserts and pastries to fresh salads and fish dishes, used in canning to increase the shelf life. The oil has a unique taste and completely absorbed by the body. Composition of the first and the second cold pressed oils. Anti-cellulite scrub with a lifting effect: Mix coffee grounds with 1 tbsp of honey and 1 tbsp of cedar oil; add a few drops of orange or other essential oil. This mixture can be used for wrapping. Skin diseases (eczema, psoriasis, diathesis, dry skin) to lubricate the affected places with oil twice a day and taken orally once a day 1 tsp. of cedar oil in the morning. 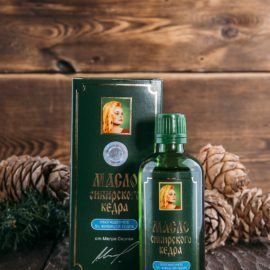 Facial massage with cedar oil helps the skin to stay young, prevents and reduces the appearance of wrinkles, makes skin elastic and restores tissue. For skin rejuvenation, this massage must be done regularly. Bath with cedar oil. If we add to bath 1 tbsp cedar nut oil, the skin is covered with a thin film of oil; the skin becomes velvety and elastic. You do not need moisturizer. Vitamin cocktail for dry and damaged hair: Whisk one egg yolk, add 1 tbsp. of cedar oil, mix and apply on entire length of hair. Wrap your head in a towel and leave on the hair for a while. Do this procedure once a week for a month. 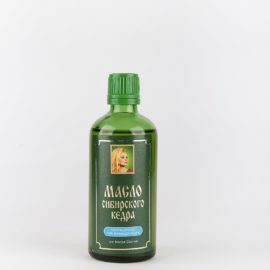 Scalp treatment: Very useful to make scalp massage with cedar oil per se. After 15 minutes wash it off with warm water. Oil also can be added to a shampoo (5 drops per 5 ml). It perfectly strengthens the hair, makes them more lush and thick. 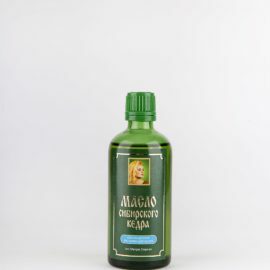 Cedar oil hair masks for dandruff: Mix 1 tablespoon of cedar oil, vodka and freshly brewed tea. The mixture is rubbed into the hair roots. Wait 2 hours. Wash with a shampoo. The procedure is carried out 2 times a week. Strengthening hair mask: Mix 1 tablespoon of cognac, yogurt, cedar oil, honey and sea salt. Apply on hair; rub well into the roots and to desired sections of hair. Wait an hour. Rinse with warm water and shampoo. Restorative hair mask: Apply a small amount of oil on the damaged sections of the hair and massage it in gently, wait 5-10 minutes, rinse with warm water and shampoo. The course is 10-15 procedures. To soften nail cuticle oil should be rubbed into the nails immediately before the removal of the cuticle.